Are you trying to save a little money when it comes to servicing your car in Waukesha? Take a look at these great car service and maintenance coupons. Keep your car and wallet happy at the same time! Just print one off and bring it in today! 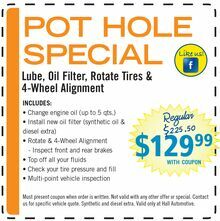 Get an oil change for only $19.99! Get $20 off when you have maintenance done on your transmission. 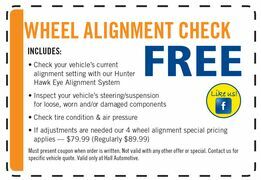 Get employee pricing on tires PLUS a free alignment check! Get a lube/oil filter change, tire rotation, and 4-wheel alignment for $129.99. 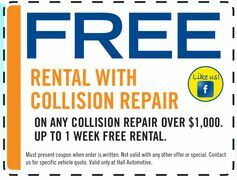 Get a free weeks rental when you have over $1,000 in collision repairs done. Get a free alignment check. If an alignment is needed receive special pricing. Get $25 off when you have your brake pads replaced. Also includes tire rotation and visual brake inspection. Get 15% off when your 100K mile car needs over $250 of work. 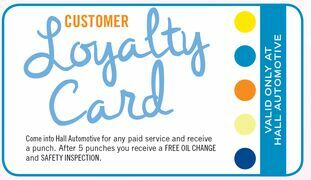 After 5 services, get an oil change and safety inspection free!